The idea behind YaSM®  is not to add yet another service management framework to the many that are already in existence, but to describe a straightforward set of processes that enables organizations to learn by example and bridge the gap between theory and practice. To this end we assessed the most often used frameworks and standards for service management and ITSM, in particular ITIL® , ISO 20000® , COBIT® , USMBOK™ , CMMI-SVC® , SIAM®  and VeriSM™ , and assimilated the common principles. The result of this effort - the YaSM service management model - is streamlined insofar as it has a perfectly clear structure that makes it easy to understand the purpose of each process. For each process, YaSM provides a detailed template, describing the activities to be performed, the required inputs and the resulting outputs, as well as the responsibilities. 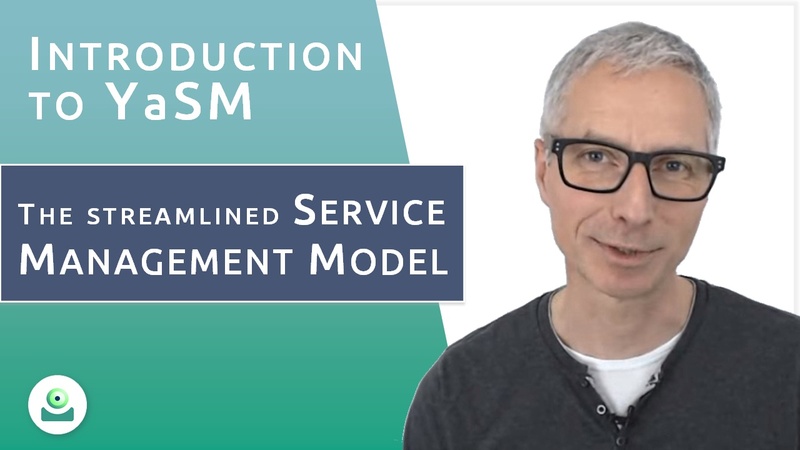 If you are new to YaSM service management, start here - in this video Stefan Kempter explains what YaSM is about and what is the best way to get started with YaSM. The YaSM service management processes are not prescriptive. YaSM is rather a basis for defining tailor-made processes that work in your organization. And YaSM doesn't have to be 'implemented' in full. You can start small, concentrating on those process improvements that offer the most benefits. Giving the YaSM model a clear, easily understood structure was important to us because we wanted to ensure the model can be adopted in a flexible way: In our experience it is almost impossible to simplify a complex system - while starting with something simple and adding more sophistication where needed is relatively easy. For a first introduction to the YaSM processes, please refer to the overview of "service management processes" in this Wiki. Service management frameworks (especially ITIL®) have until recently been used mainly in the domain of information technology (IT) services, for whom these frameworks were originally created. As ITIL grew popular, more and more organizations realized that ITIL and service management best practice can be applied to all types of services, such as HR, financial, healthcare, etc. (a trend that is often referred to as "enterprise service management"). So we made a point of ensuring that YaSM is accessible and easy to understand for everyone providing services. Time never stands still, and the service management discipline keeps evolving. ITIL® started some 30 years ago with a focus on operating IT infrastructure. Today many service providers are better described as 'service integrators', as their customer-facing services are based on supporting services supplied by third parties. What's more, service management best practice is increasingly applied in other areas outside of the IT organization (see above). SIAM®, for example, contains guidance specifically for service integration, and VeriSM™ introduces the 'management mesh' as a management approach from the organizational level. At the same time, service providers discovered that they can greatly benefit from concepts such as Agile, Lean, DevOps, Kanban, etc. As a result, the service management discipline is now getting more diverse. But its key principles are well established, as enshrined in ISO/IEC 20000 ('ISO 20000'), the international standard for service management. We have thus ensured the YaSM model is perfectly aligned with ISO 20000. Everyone versed in ITIL®, ISO 20000, SIAM® or VeriSM™ will instantly feel at home, and you can easily extend the YaSM processes with inputs from these frameworks - or indeed with any other concepts and ideas that help you with providing better services. The main product in the YaSM product family is the YaSM Process Map: For each process and sub-process, the service management process model defines in the form of a diagram the activities to be performed, the required inputs and the resulting outputs. It also contains a full set of detailed document templates ("checklists") for the documents and records produced by the YaSM processes. The YaSM Process Map is currently available for two platforms, Microsoft Visio® and ARIS™. All diagrams and documents are completely editable, which makes the process model the ideal starting point for developing a set of processes tailored to the needs of specific organizations. An additional component (the YaSM - ISO 20000 Bridge) relates the YaSM processes to the ISO 20000 requirements and specifically addresses the needs of organizations that wish to achieve certification against ISO 20000. It's the perfect companion as you get ready for the ISO 20000 audit. 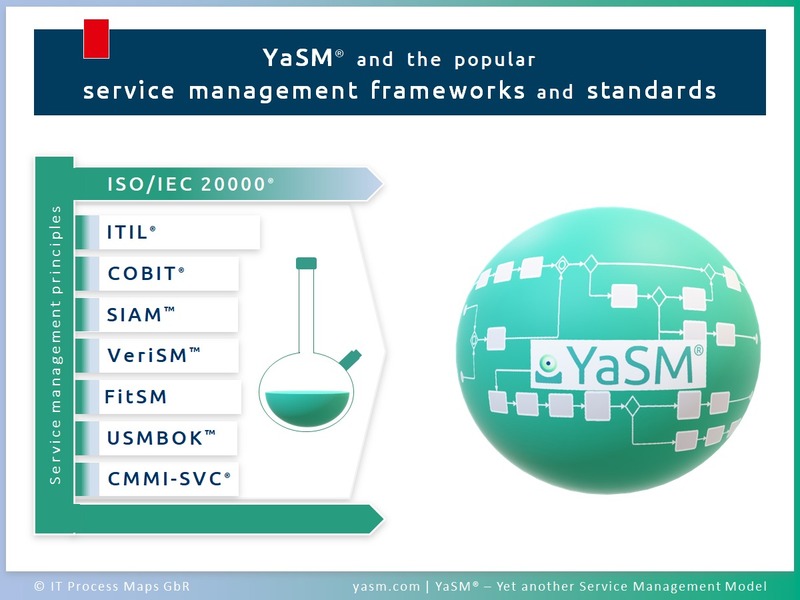 For more information on the YaSM Process Map and the ISO 20000 Bridge, please refer to the product pages on the YaSM web site - or explore our video tutorials about YaSM service management and the YaSM process model! Since 2006 we have been supplying an officially accredited process model for ITIL (the ITIL® Process Map) to help IT service providers with understanding the principles behind ITIL and designing their ITIL-aligned processes and documents. Our approach to presenting the ITIL concepts in the form of process diagrams has been well received and is used by hundreds of organizations world-wide. But from countless conversations with our customers it became clear that many find the existing guidance useful in principle, but too complex and difficult to understand. So we decided that, after some 20 or 30 years, it was time for a fresh start with a new, streamlined process model that is easier to understand, has a perfectly clear and pragmatic structure, and is supported by a full set of ready-to-use templates. What's more, we wanted to offer a model that can be used for business service management/ enterprise service management, as well as ITSM. And that's how the idea for YaSM was born. We spent two years developing the YaSM model and published the initial version of YaSM 1.0 in 2014: The YaSM model is a translation of service management 'best practice' into a streamlined, accessible set of processes and ready-to-use templates. The first major update was completed in 2018 to incorporate user feedback and align the YaSM processes with the latest edition of ISO 20000:2018. 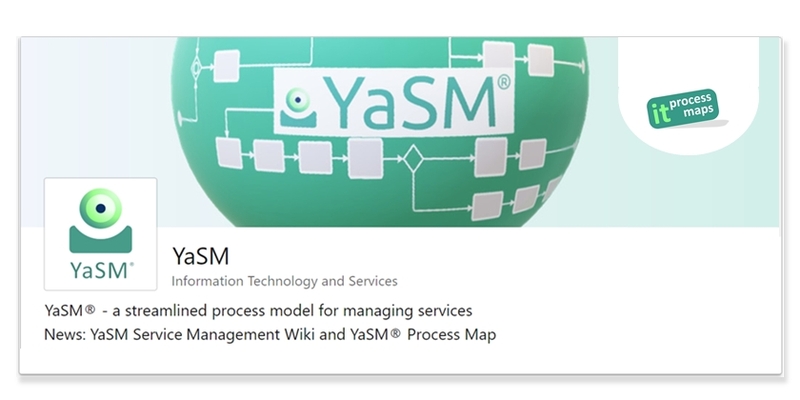 YaSM is on LinkedIn, where we keep you updated about YaSM, the Service Management Wiki and our YaSM process model. ... or join YaSM on Twitter! VeriSM® is a registered trademark of IFDC.